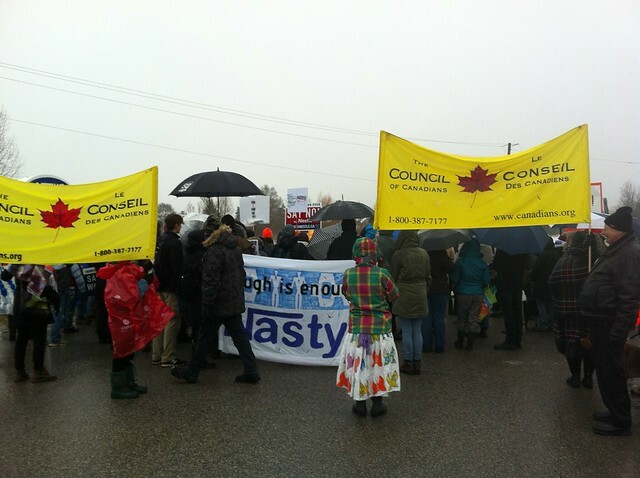 Guelph Chapter at the SAY NO TO NESTLE RALLY, Aberfoyle Plant, November 24. Learn more and take action! A large part of the Council of Canadians’ strength comes from our chapters working to build the kind of Canada we want. Join a chapter and meet people who share your interests and values and find out more about how you can be involved in your community. See if there is a chapter near you and if not, contact us to discuss starting one! Below are a few recent highlights – send your actions and events to your regional organizer – we’d love to add your photos to our Flickr photostream too! Chapters (Northumberland, Peterborough and Kawarthas, Guelph, Quinte, and others!) have sent letters to their MP’s re don't sign USMCA on November 30. Action: Tell Trudeau Not to Sign the New NAFTA Deal! Safety at the Co-operative Refinery in Regina and what it means for Regina residents. Watch this video of a two-hour discussion from an employee perspective. A long-time supporter of the Council recommends this video to help to inform our work: https://www.cbc.ca/radio/frontburner/the-psychology-of-climate-change-communication-1.4898262 and https://climateoutreach.org. Here are a few recent highlights online – reTweet, share, like & follow! See what #CouncilChapters are sharing on Facebook! To add your chapter feed, please send it to chapters@canadians.org.